On October 9th, Crunchyroll announced that their mobile game DANMACHI: MEMORIA FREESE will release a collaboration with ATTACK ON TITAN. The in-game event will start on Tuesday, October 30th and run until Wednesday, November 21st. Players can expect to fight alongside their favorite ATTACK ON TITAN characters in a fierce battle against the Titans. DANMACHI: MEMORIA FREESE allows players to put themselves into the anime IS IT WRONG TO TRY TO PICK UP GIRLS IN A DUNGEON?. 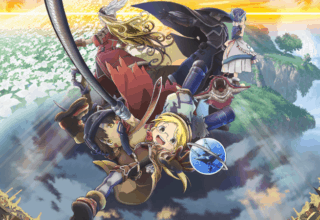 The game, nicknamed DANMEMO, is a free mobile RPG available on iOS and Android. Remarkably, the game features full voice acting from the anime cast, as well as both anime and light novel stories. This means you can follow Bell Cranel through his adventures working under the goddess Hestia. Then, through SWORD ORATORIA, view the series as Ais Wallenstein and the Loki Familia experienced it. As such, the game lets you enjoy the best of both worlds in DANMACHI. 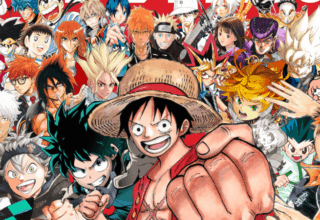 Imagine how incredible it will be to add ATTACK ON TITAN to the mix! Is It Wrong to Fight a Titan in a Dungeon? ATTACK ON TITAN takes place in a world ravaged by monsters called Titans. It follows Eren Yeager, who joins the military with his childhood friends to avenge the death of his mother. Plenty of fans of the show feel inclined toward vengeance as well. With popular characters always in such dangerous positions, DANMEMO offers a great chance for fans to finally take out their frustrations and avenge slain characters. The crossover begins at 7 pm PT on the 30th and continues until November 21st. Play as existing DANMEMO characters like Bell and Ais as you fight to defend the city Orario from a titan attack. Just like its existing fully-voiced gameplay, DANMEMO brings in the original voice actors from ATTACK ON TITAN. So get ready to be a part of the ATTACK ON TITAN action you love. 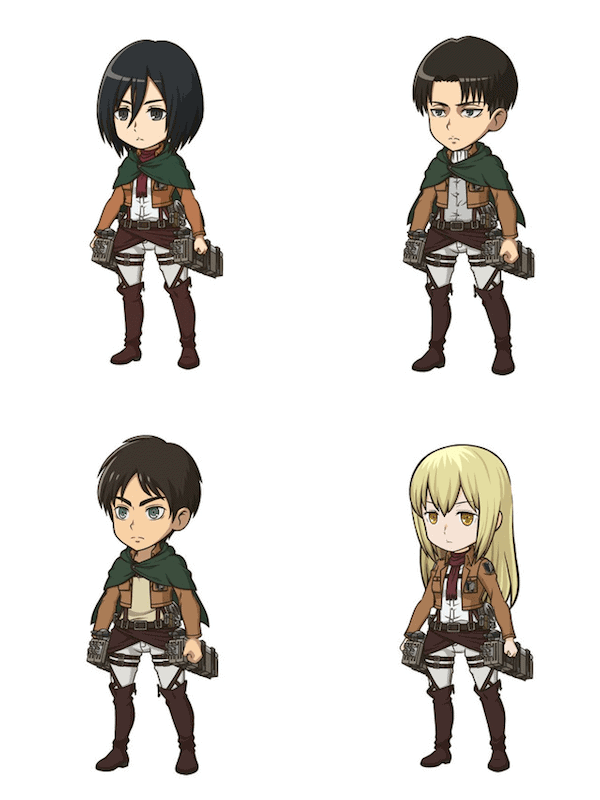 For playing the game during the crossover event, all players will be able to receive a ★4 Eren unit in-game. Crunchyroll first released DANMACHI: MEMORIA FREESE in North America on March 30th this year. In addition to the main storyline, the game offers side stories you can access through completing quests and gifting things to other characters. A full subplot for ATTACK ON TITAN fits right in with DANMEMO’s varied gameplay. Play as different characters to unlock a variety of great DANMEMO content. Looking forward to the crossover, but never played DANMEMO before? Signup is simple! Download the game by going to the DANMEMO website and clicking “Download” on Google Play or the App Store. Of course, you do need to be using either an Android or iOS device. With the game downloaded, you’ll be ready for the release later this month. See how far you can get before the event begins! Beyond playing the game itself, you can read or watch the series that inspired the collab, too. IS IT WRONG TO TRY TO PICK UP GIRLS IN A DUNGEON? has ongoing light novel and manga adaptations and the complete anime can be found on Crunchyroll and the DanMachi website. ATTACK ON TITAN’s anime is currently halfway through the third season and going strong. You can watch the first season on Netflix or catch up on Funimation and Crunchyroll. Do you play DANMACHI: MEMORIA FREESE? Interested in the ATTACK ON TITAN crossover? Let us know what you think in the comments below! On October 31, 2018, DANMACHI: MEMORIA FREESE released new promotional content for their ATTACK ON TITAN crossover! Chiefly, the game released a new promo video and some gameplay assets displaying character art and dialogue from the crossover event. Here we see some of the characters having the chance to interact for the first time. While the gameplay assets showcase conversation, the actual gameplay includes plenty of action. During the event, players will receive a commemorative ★4 Eren unit and 11-draw gacha for free, once a day, until November 6th. The promo video below shows ATTACK ON TITAN’s Eren and Levi preparing to enter the DANMEMO world and announcing the collaboration. 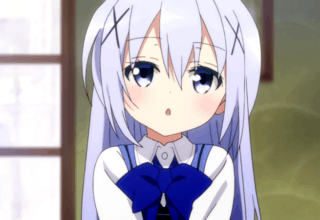 Like the game, the video features voice acting from the original voice actors. Check it out! It has been six months since the release of ‘DanMachi Memoria Freese.’ Our biggest thanks go to you, the fans, for your continued support. 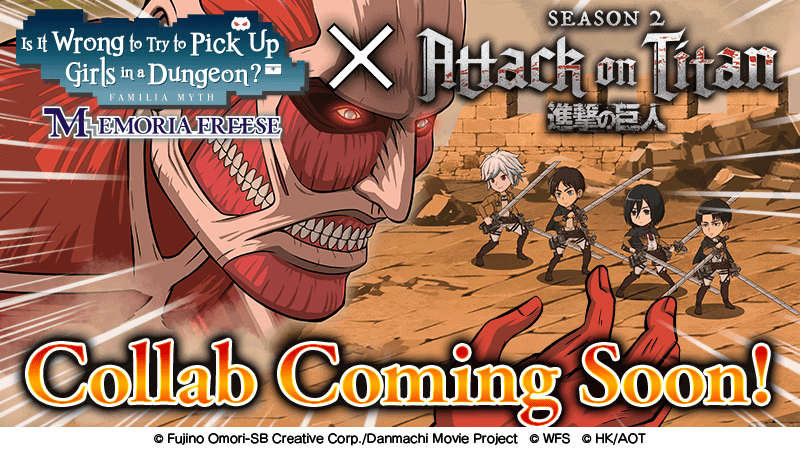 To commemorate this milestone, we have put together an exciting dream collaboration with ‘Attack on Titan Season 2,’ just for you! 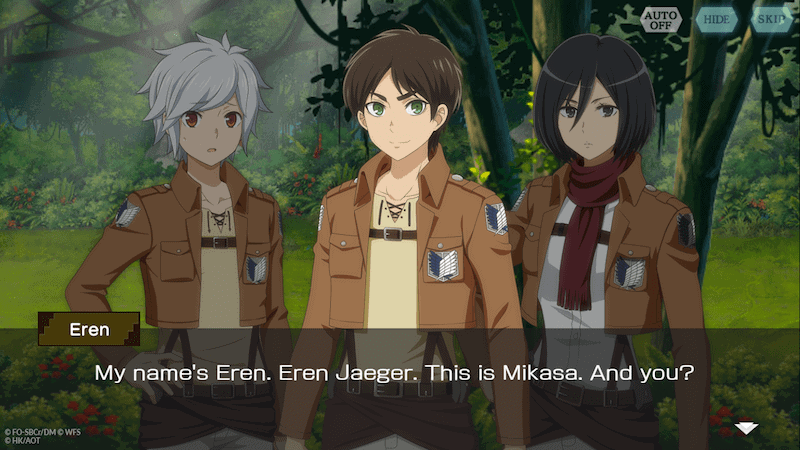 You will be able to experience interactions between DanMachi and AoT characters as they battle titans—even the Colossal Titan—together, and you will be able to play through many original in-game events and campaigns. We on the development team dedicated our hearts to create a world that fans of both DanMachi and AoT can appreciate, so we hope all of you active fans, and even dormant fans, will enjoy it!